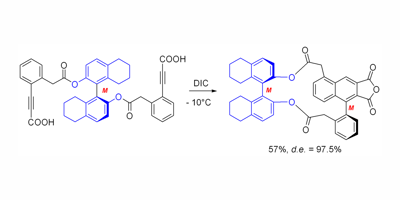 An asymmetric variant of the dehydro-Diels–Alder (DDA) reaction has been developed and applied in the atropselective synthesis of various (1,5)naphthalenophanes. Whereas the suitability of the photochemically induced DDA (PDDA) was limited, the thermally induced DDA provided the desired product, depending on the chiral auxiliary used and the length of the linker, with nearly perfect stereoselectivity. Furthermore, the mechanism of the DDA was investigated by means of DFT calculations, and a stepwise mechanism involving 1,4-biradicals was suggested.